The schoolannual Co-Curriculum Award Ceremony was held on Thursday, 11 November, 2010.Our VIP guest of honour, YB Raja Datin Seri Salbiah binti Tengku Nujumudin,wife of the Menteri Besar of Negeri Sembilan graced the occasion.In her keyaddress, YB Raja Datin Seri expressed pleasant surprise and pleasure at thepresentation of a video recording of her student days in ACS. She thanked the principal and the school administration for the greatlengths at which the meticulous video documentation of her was done. Amongother things, she advised students to excel both in academic and co-curricularactivities. She then awarded certificates and cash prizes to students forco-curricular excellence. She also contributed her personal cash rewardsto students from all categories for bringing glorious victories for ACS atdistrict, state, national and international level competitions. As an expression of gratitude, our principalpresented her with a basket of fruits and a portrait of her drawn by one of ourteachers. The event ended with a sumptuous buffet lunch cooked specially for YB Raja Datin Seri by amember of our staff, Madam Siti Zabedah binti Abdul Manaf. Tristan Chang Juin Han represented Malaysia in the MartialArts Competition, held in Shanghai, China on 18 November 2010. The event wasorganized by the World Chin Woo Martial Arts and Culture Assembly. He won aSilver Medal in the ‘Hand Martial’category and a Gold Medal in the ‘LegMartial’ category. In recognition to his contributions towards Wushusports, the Negeri Sembilan State Government awarded him a Certificate ofAppreciation and RM 500 from the Menteri Besar of Negeri Sembilan. ACSians areproud of him. The registrationof new Form One and Remove class students was carried out on 31 December 2010.The Principal addressed these new comers together with their parents on issuesof school rules and disciplinary matters. It is hoped that these young liveslive up to the school’s aspirations and be the new torch bearers of ACS. 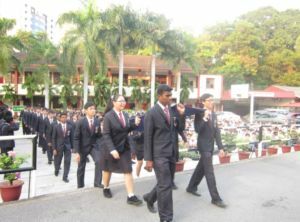 The Form One andForm Four students had their orientation program on 5 - 6 January 2011. Amongother things, they were briefed on the school’s infrastructure, school rules,academic and co-curricular matters. The Form Four students were introduced tonew Science and Arts stream subjects. 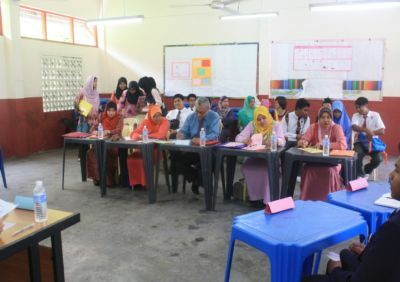 They were advised to make careful decisionsin matters pertaining to the choice of subjects available to them for the SPMnext year. A massive ‘gotong royong’ was carried out on 7 January 2011after the long December school holidays. Students were busy cleaning up theirrespective classrooms and corridors from 7.30am.-9.00am. It was fun time forthem as well. A leadershipcourse for class monitors from the morning session was conducted by our schoolcounselors on 17 January 2011 at theschool library. Participants were briefed on leadership qualities andresponsibilities entrusted to them. It is hoped that these young leaders willcarry out their duties without fear or favour. In conjunction with the Chinese New Year, ACS organized a calligraphy competition forall students and teachers on 27 January 2011. It was indeed an exciting eventand the response was overwhelming. Participants took part in writing Chinesecharacters as well as Tamil and Jawi characters. Our Principal gave away prizesto the winners. The 1stfire drill for this year was held on 18 February 2011. Ademonstration on how to use the fire extinguisher and to put out a fire wasgiven by Mr. Redzuan bin A. Aziz. Students were commended on their swift andorderly mobility to the basketball court and for complying with the routesdesignated for them by the school. Students were also briefed on safety measures,emergency exits and escape routes in the event of a fire. A freak storm wreaked havoc in ACS on 28 February 2011 after a torrential down pour late thatevening. The main stairway, walkways and basketball court were littered withblown off roof tiles, branches, toppled potted plants and all kinds of otherdebris. The morning of the aftermath shocked all ACSians. A massive cleanup andrepair works was carried out immediately. We thank our Principal Mr. Thong KokChaw for his effective and immediate response in addressing the wreckage caused. Latihan rumah sukan telah bermula mulai 22/03/2011hingga 28/04/2011 bertempat di Padang SMK St. Paul Seremban. Tarikh KejohananOlahraga Tahunan ialah 28/06/2011 bertempat di Stadium TAR, Paroi. Rumah Baileydan Rumah Jones akan berlatih pada hari Selasa manakala Bowmar dan Summers pulapada hari Khamis jam 8.30-9.45 pagi (Sidang Petang) dan 2.30-3.45petang (Sidang Pagi). Kehadiran semua pelajar diwajibkan dengan memakai pakaiansukan. Disiplin sekolah terkawal. Unit Bimbingan dan Kaunseling Sekolah telah menganjurkan ceramah antidadah pada 28/03/2011 bertempat di tapak perhimpunan. En. Basharuddin Bin Said telah memberi ceramah ini. Melalui ceramah ini, murid telah mendapat kesedarantentang bahayanya dadah. 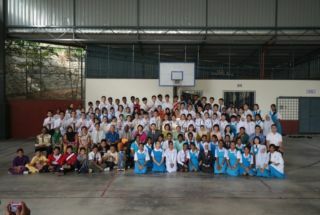 A combined Christian Fellowship for Seremban Schools was held on 2 April 2011 at the Methodist Youth Centre. The theme ‘Father Heart of God’ was indeed befitting the event. The guest speaker from Scripture Unionaddressed the participants. 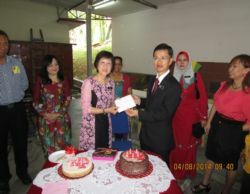 The principle Mr. Thong Kok Chaw, Senior Assistant1 and Senior Assistant of Co-curricular Affairs graced the occasion. 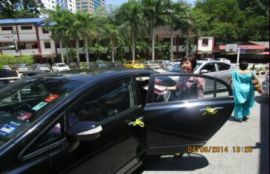 We thankMiss Ng Mui Ching for organizing the event. Majlis pelantikan Pembimbing Rakan Sebaya telah diadakan pada 04/04/2011 di tapak perhimpunan. Falsafah PRS ialah “membantu diri untuk membantu orang lain”. Seramai 10 orang murid telah dilantik. 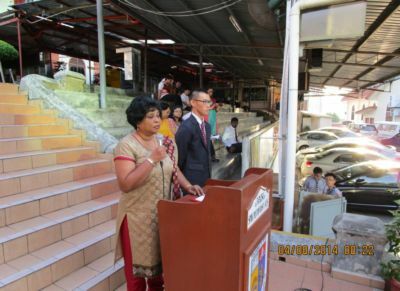 ACS hosted theSeremban District Zone 2 Tamil Language Carnival on 2 April 2011. An array of Tamil Literary and Language activities were carried out and attractive prizes were awarded to winners. The glorious transformation of the Methodist Court to the Pusat Kegiatan Ko-Kurikulum. ACSians owe ourgratitude to the Menteri Besar of Negeri Sembilan, Yang Amat Berhormat Dato’Seri Utama Haji Mohamad bin Haji Hasan for his noble role in escalating this project and officiating its opening on 10 May 2011. Thank you Dato’ Seri. Into the annals of ACS history. . . .
An air of excitement and anticipation filled the dawn of Tuesday, 10 May 2011 for the ACS community….. the Menteri Besar of Negeri Sembilan, Yang Amat Berhormat Dato’ Seri Utama Haji Mohamad bin Haji Hasan was coming to our school for the ‘Official Opening and Handing Over Ceremony’ of the Pusat Kegiatan KoKurikulum. Our principal, together with the many VVIP gave the MB a rousing welcome to the accompaniment of kompang beats steeped in ceremony and protocol. Led by bunga mangga and bunga paha bearers,the MB and his entourage made their way to the PKK while acknowledging our academic and non-academic staff who had lined along the route to honour him. The ceremony geared towards a more serious tone when the principal-par excellence, Mr. Thong Kok Chaw addressed the audience. Among other things, he stressed on the school’s vision and mission whilst highlighting our students academic and co-curricular achievements at district, state, national and international levels. He also highlighted the various infrastructure and facilities constantly upgraded andprovided in ACS to ensure holistic and quality education for our students. Hisvision for a Multimedia Room and a Projector Room whilst upgrading the existing classrooms is a project he hopes to undertake and accomplish in the near future. 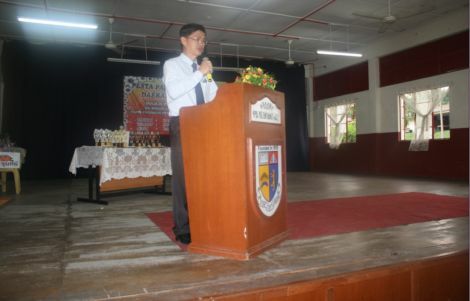 The Director of Education, Tuan Abdul Halim bin Abdul Razak then addressed the audience. In his speech, he highlighted academic andco-curricular achievements in Negeri Sembilan schools and encouraged students to actively participate in both these fields for a holistic education. 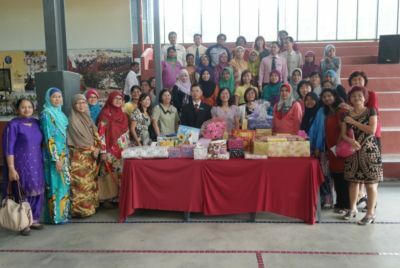 He also motivated parents to be pro-active in their children’s education to ensuresuccess. The most awaited moment arrived and to the eager anticipation of the audience, the MB spoke. He expressed sheer joy at the huge success of the school in both academic and co-curricular activities and went onto joke that ACS was not known for high profile victories during his school days! Among other things, he highlighted the multi faceted role played by schools today that have taken a new dimension with constant transformation and equipping students to assimilate into the globally challenging world. The audience especially students were all ears to the MB’s inspiring speech. He ended his speech by challenging students to excel in their entireschool endeavor and make their school life a memorable one. The MB then presented a mock cheque of RM10,000 to our principal who in turn presented him with an authentic batik painting created by one of our teachers, Madam Azizah binti Ahmad. The MB upon receiving this batik painting requested for Madam Azizah to come up to the stage where he personally thanked her for her painstaking masterpiece. 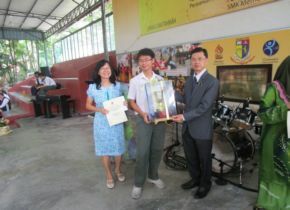 Then the MB awarded top SPM and PMR scorers with acertificate and cash prize individually. He also gave his personal cash gifts to all these elated recipients who went up stage together with a parent. Deafeninga applause from the audience continued as the MB and his entourage was then ushered out of the PKK by the principal to the Methodist Centre where he signed the ‘Guests Book’. The MB then toured the exhibition centre whichshowcased students’ art and craft, products made by the school Young Entrepreneurs,exhibits showing our school Scouts’ craftsmanship skills and exhibits from theschool Red Crescent Society. The final leg ofthe MB’s historic visit was to the school hall where guests, visitors and a host of VVIP and ACS staff awaited patiently for the MB to a sumptuous banquet lunch. The school level Teachers Day Celebration which coincided with the National Level Celebration son 16 May 2011 was celebrated on a modest scale. 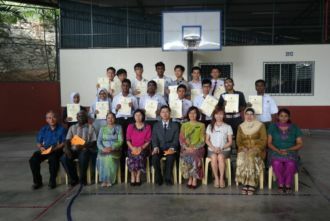 In his key address in aspecial assembly held at the Pusat Kegiatan Kokurikulum, the principal highlighted the significant role and sacrificesof teachers in moulding young lives. In keeping withthe tradition, teachers reaffirm their oath and sang the Guru Malaysia song. The school choir then gave a presentation after which an aerobic session was conducted for interested teachers. The response from teachers was good amid the cheers from student spectators. The celebration culminated with a modest meal, courtesy of the principal and the canteen operators. Perayaan hari koperasi sekolah telah mula disambutsejak tahun 1995. Bagi tahun 2011 Hari Koperasi Sekolah telah disambut denganbaik mulai 27 Jun hingga 30 Jun 2011. Objektif HKS mempromosikan kepada wargaACS tentang kewujudan koperasi sekolah dan nilai-nilai keusahawanan harusdipupuk dalam kalangan pelajar. Sepanjang minggu HKS telah adakan beberapaaktiviti seperti Pendidikan Kuiz , aktiviti Sosial Persatuan Pengguna dan Pertandingan Projek Keusahawananbertempat di Methodist Center. Kelab Keusahawanan Koperasi Peringkat Sekolah 2011 telah mengadakan sambutan hari koperasi peringkat sekolah bertarikh 30 Jun 2011, masa 2.30 petang bertempat diperpustakaan.Tema tahun ini ialah “1Untuk Semua, Semua Untuk 1”. Objektif konvensyen mini ini diadakan untuk memupuk nilai-nilai keusahawanan seperti kreatif, inovatif,bijak mengambil peluang dan berani menanggung risiko dalam kalangan pelajar. Program ini telah diadakan di Glory Beach Resort, Port Dickson pada 24 Jun 2011. 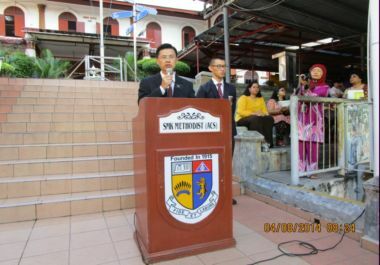 Peserta SMK Methodist ACSShazrin bin Zainurin dari 3 Bestari telah menerima Anugerah Perak peringkatKebangsaan. 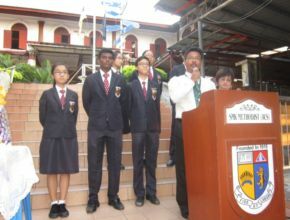 On 2 July 2011, the 1 MalaysiaRun was held simultaneously for all schools in Malaysia. This event also made itsway into the Guiness Book of Malaysia Records for the largest number of runnersat a single time. 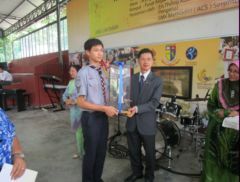 In ACS, the event was flagged off at 7.20 am by our PrincipalMr.Thong Kok Chaw. Students and teachers participated and ran along thedesignated route. Security measures were stringent with patrol police on bikes.Students had games sessions after the 1Malaysia Run. Everyone enjoyedthemselves. The Art & Craft and NaturalResources Exhibition was held on 7 July 2011 at the Methodist Center.The event was jointly organised by the Art & Craft and Geography panels.Students’ creativity and art & craft products as well as photographs &pictures of the wonders of the world were exhibited. The principal Mr.Thong KokChaw officiated the occasion. Acsians are indeed multi talented. The UNSW English Test was held on12 July 2011 at the ACS School Library. A total of 55 candidates, including anexternal candidate from SMK Chan Wa, Seremban, sat for this test. We are proud that 5 of our candidates scored the Distinction level pass while 12 othersscored Credit level pass. This indeed is a praise worthy feat which put these candidates as well as ACS on a world class platform. Well done. The Form 5 prefects of ACS werefeted to a sumptuous lunch on 16 July 2011 at the Royal Bintang Hotel,Seremban. It marked the grand finale to a role well played by them all. Tohonour them were our Principal par Excellence, Mr Thong Kok Chaw, SeniorAssstant 1, Madam Chuan Teik Mei, Senior Assitant of Students & Affairs,Madam Ooi Sow Lay, Senior Assitant of Co-Curicular Affairs , Madam SurinderKaur, the Afternoon Senior Assistant, Mr Chang Van Leong, the prefect mistresses,counsellors and discipline teachers. The school annual sports was heldon 19 July 2011 at the Stadium Paroi, Seremban. Students unwound from theroutine classroom atmosphere and set free to enjoy themselves by participatingin various events. Trophies and medalswere given away to winners by our principal. Well done to all students and teachers for the months of preparation. On 1 August 2011, themorning and afternoon session first student from all classes were awardedRM50.00 each as an incentive by Miss Rebecca Backus, President of the ACS OldStudents Association. The incentive was given in a special meeting with MissBackus. Pulsating ACS extends its gratitude to ACSOSA for its kindcontribution. It is hoped that such incentives will motivate our students towork even harder. The month long Independence Dayand Malaysia Day celebration which was launched on 1 August 2011 was officially declared close by our principal- par excellence, Mr.Thong Kok Chaw during the school assembly on 12 September 2011.The event culminated with the singing of patrotic songs and waving of little flags. Students turned up in colourful cultural costumes which added live tothe event. Classes resumed as normal thereafter. 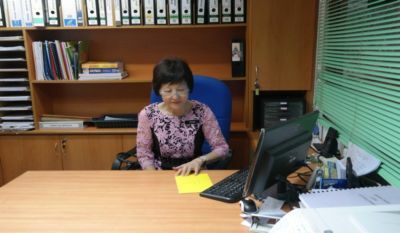 Persatuan Bahasa CinaSMK Methodist (ACS) telah menganjurkan ‘Pesta Tang Lung’ yang telah dirasmikan oleh GPK 1 Puan Chuan Teik Mei pada 8 September 2011 bertempat di Gelanggang Bola Keranjang. Pertama kalinya band sekolah ACS telah memberi persembahan yang sangat menarik pada malam itu. Kehadiran ahli-ahli PBC sungguh menggalakan. Bekas ahli PBC juga turut hadir bagi memeriahkan lagi majlis tersebut. Pada malam itu, para pelajar telah menunjukkan kebolehan merekadengan tarian-tarian, pertunjukkan magik, dan juga sketch yang amat menarik.PBC juga menjemput beberapa buah sekolah sebagai jemputan khas. AJK kelab dan persatuan ACS juga turut hadir pada malam itu. Tahniah PBC!! Teruskan usaha anda. 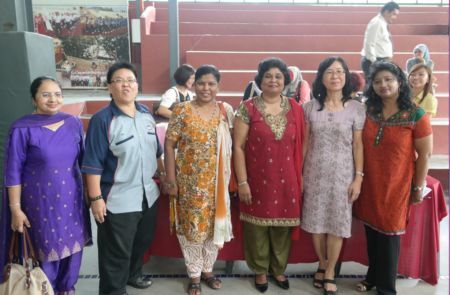 The Tamil Language Society of ACS organised the Kolam competition on 22 September 2011at the PKK. Response from participants was overwhelming. Students as well asteachers produced brilliant and creative works of art using coloured ricegrains. Prizes were given to winners from various categories. Pulsating ACS congratulates the advisor of the society, MadamSusheela Govindarajoo and her committeefor a job well done. Majlis Anugerah Kecemerlangan Kokurikulum 2011 SMK Methodist (ACS) telah berlangsung pada 28 September 2011 bertempat di PKK. Encik Liew Kwek Onn, YDP PIBG telah merasmikan majlis ini. Ramai pelajar sekolah pulatelah mengambil bahagian dalam persembahan. 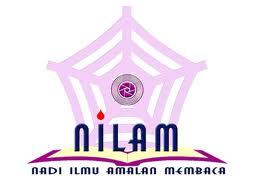 a) Madam Sree Lata Indran, the Head of Science and Mathematics Departement who retired on 27July 2011. Madam Sree Lata had served in ACS since 1986. Students who were taught by her remember her as a brilliant, hardworking and lovable teacher. c) On 15 June 2011, the afternoon staff bade farewell to Madam Srivani and Miss Suganthini who had requested fortransfer to schools nearer to their homes. Pulsating ACS expresses its gratitude to them for their service. Kem tahunan pengawas telah diadakan di INTI International University College, Nilai pada 18 dan 19 november 2011.Semua pengawas telah menghadiri kem ini.Tujuan kem ini adalah untuk menanam sifat kepimpinan dan disiplin dalam setiap individu.Kem ini telah berlangsung selama 2 hari dan 1 malam. Dari 18hb November 2011 hingga 25hb November 2011 seramai 12 ahli pengakap SMK Methodist (ACS) telah menyertai Jamboree Antarabangsa di Terengganu.Perkhemahan ini dibuka kepada semua pengakap Malaysia dan Negara lain.Ahli pengakap telah memperolehi banyak ilmu daripada aktiviti kem ini.Ahli pengakap haruslah menyertai perkhemahan-perkhemahan sebegini untuk menambahkan ilmu pengakap. 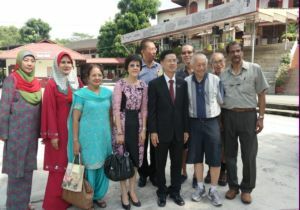 Pada tarikh 13 November 2011, sekolah SMK Methodist (ACS) telah hantar 13 ahli pengakap ke JOTA DAN JOTI perkhemahan di Bukit Putus, Negeri Sembilan .Aktiviti ini bertujuan untuk memberi peluang kepada peserta untuk berinteraksi di peringkat antarabangsa melalui Radio Amaetur atau “Hem Radio” dan mengadakan aktiviti pengakap .Pengguna –pengguna radio Amaetur telah berhubung dengan rakan –rakan mereka diseluruh dunia melalui beberapa set frekuensi radio yang telah ditetapkan. Majlis ini diadakan pada 10 Nov 2011 di tapak bola keranjang . Majlis itu bermula pada pukul 7.30 pagi . Tuan Pengetua telah memberi ucapan khas yang menyuntik semangat pelajar yang bakal menduduki peperiksaan . majlis tersebut diakhiri dengan restu daripada semua guru ACS. 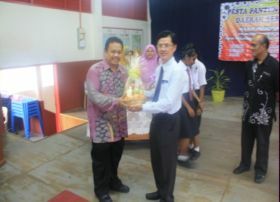 Kem tahunan BSMM telah diadakan di SMK Methodist (ACS) Seremban, pada 25 dan 26 November 2011. Semua ahli BSMM yang terdiri daripada ahli Tingkatan 1 hingga Tingkatan 5 telah menyertai kem ini. Tujuan kem ini diadakan adalah untuk menanam sifat kepimpinan dalam diri setiap ahli dan mengeratkan hubungan sesama ahli BSMM. Pelbagai aktiviti yang menarik diadakan untuk menguji kemahiran dan kerjasama setiap ahli dalam kumpulan masing-masing. Peserta lelaki dan perempuan terbaik serta kumpulan terbaik juga dipilih dan diberi hadiah. Registration of New Form One and Remove Class Students. 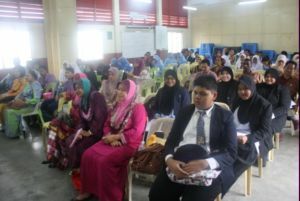 Registration of new Form 1 and Remove class students took place at the Pusat Kegiatan KoKurikulum on 3.12.2011. The principal addressed them on issues pertaining to school rules and discipline matters. The new students together with their parents were all ears to the principal’s sound advice. It is hoped that these young lives will be nurtured with a holistic education and good values here in ACS.